A lot of new players in Guild Wars 2, or more confirmed players, want to play Elementalist, but it’s very squishy especially at begin, and very discouraging if you play the wrong build. 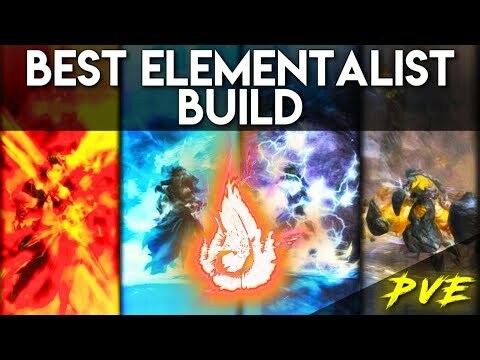 So here is a small guide for everyone who want to play Elementalist in Open World PvE, with a build easy to play, and efficient to fast kill mobs and survive. There is no pretension at all, I don’t say this is the only viable Build, but it might help some of you to keep going or to start Elementalist. I explain the Build, how to DPS, how to heal, & some very basic Combos. I have easier build, its called edgy elementalist and the first step is when you create your character, you click on green elementalist class. Your video is cool. I'm not sure though if it's practical to suggest a build that's easy for 'beginners' which requires you to already be level 80 with Tempest unlocked. You can use Arcane instead of Tempest. It may not have the overload skills that Tempest has, but it reduces the cooldown on attunements and you also grant yourself and allies boons. Even if you own the Heart of Thorns expansion, you're still going to play core elementalist from the start and you'll have to get hero points to unlock both the core specializations and tempest. Water is a viable option if you're not playing a Fresh Air build. So if you're not using Air, which is fine especially for core elementalist, you can use Fire, Water and Arcane. Pyromancer's Training gives you 10% damage increase while in fire attunement, Aquamancer's Training trait gives you 10% increased damage while above 90% health, Healing Ripple heals you and allies when you swap to water attunement and Arcane reduce attunement cooldowns. Can't watch the video at the moment, but what do you recommend for gear? Berserker, marauder or mix. Check this build. It's a good build, but in what sense is this "beginner-friendly"? I agree with @Cragga the Eighty Third.6015 that you wouldn't expect someone who is a beginner to the open world to have unlocked Tempest, which requires them to have played a substantial amount in the open world already, some of it in expansion maps. Sure, you could adapt it to a Core build before you unlock Tempest, but I don't think it's reasonable to expect a beginner to do that, or even know how to do that. Added to that, the build revolves so heavily around Overload Air (and little around Warhorn) that a Core version would have very different usage anyway. Also, I don't think you're getting the full benefit from those Scholar runes - you almost never seem to be above 90% health, and I doubt a beginner would be either. Personally i'd recommend beginner to try a bit of everything instead of relying on a specific build. For core elementalist, you can very well build around signet, glyph or arcane and have good result in PvE. Only MH dagger can be tricky to master when you begin the game. The best thing for beginners in open world pve is to go ranged on any class but its out right needed to be a ranged build as an ele there not enofe armor / hp from gear in the world to make you not a mages class (with out real boon def) in this game. But it has access to blinds and elementals so you're not even being hit most of the time.